"There is an adage among old hands in the art world that the emergence of art investment funds signals that a boom is over. This was true in the late 1980s and again in 2006-08. The wisdom is based on the fact that art investment funds are usually created by and designed to appeal to individuals with limited experience in the art market. And indeed, the setbacks that some parts of the art market suffered as a result of the global financial meltdown in the fall of 2008 were not predicted by the most recent crop of art-fund promoters. For them, the art market defied gravity, and they ignored its historically cyclical nature. "Strong prices, high-profile big spenders, and glittering openings make good copy. The media carries the message that 'art is hot' far outside the art world, and people like me start getting calls from financial reporters anxious to file stories about one or another aspect of what is to them a novel phenomenon. These stories inspire entrepreneurs to use art to approach individuals, insurance companies, and pension funds with billions of dollars but no passports to the seductive world of art investment. "From an economic point of view, works of art have the interesting feature of being dual in nature. On the one hand, they are 'consumer durables' or objects to consume as they are viewed, yielding an aesthetic and non-monetary viewing benefit. On the other hand, they are simultaneously capital assets that yield a return from their appreciation in value over time like other financial assets. "Unknown to most art-fund organizers today is the only one to have had great success, largely a matter of good luck with timing. In 1904 a young French financier, Andre Level, invited twelve friends to form an art investment fund he named, with intentional irony, La Peau de l'Ours, after a fable by La Fontaine in which hunters sell the skin of a great bear but were unable to catch it -- a warning about speculation. The group bought work by artists such as Gauguin and Monet, who were still unfamiliar to many members of the public, as well as complete unknowns like Picasso, Matisse, and Vuillard, a total of almost 150 paintings. They made no secret of the fact that they were buying for investment; and after ten years, in 1914, they put up everything at auction. The return was approximately four times their investment. They gave 20 percent of their profits back to the artists. 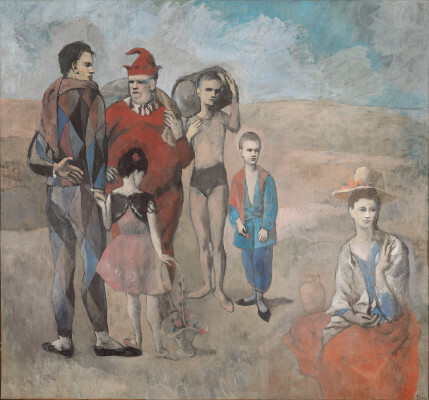 The sales focused attention on many of the younger artists, particularly Picasso, whose huge painting Family of Saltimbanques (1905, fig. 16), now at the National Gallery of Art in Washington, D.C., was the star of the sales. The principal reason for success was galloping inflation and the luck of scheduling the auctions before, and not after, Archduke Ferdinand was assassinated in Sarajevo. Thus started the war to end all wars, which would have put a considerable damper on the venture. "There were very few art funds left standing in 1991. After 2000 new ones started to emerge, but few survived the economic setbacks of fall 2008. As for tears, there were many. The online Distressed Debt Report for January 2009 announced that the bankrupt hedge fund SageCrest was suing art lender Ian Peck and his Art Capital Group for millions of dollars, part of a tangled web of suits, countersuits, and claims of fraud. This is just one example of many such unhappy endings involving art funds."